When I read Hannah Kent's 2013 debut, I was supposed to be vacuuming my room. But I was reading instead, and I was reading about dark, cold, Iceland, and by the time I had finished the book, I had climbed into my bed and pulled the covers up because my whole body felt frozen. That was the power of that book. Hannah Kent's writing had taken me to a place I had never even been. 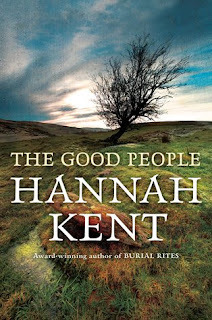 Since reading it, and since it became a global phenomenon, I have seen Hannah Kent speak at the Perth Writers' Festival, and seen her give interviews on television. There is no doubting that she is a thoughtful, intelligent writer who takes her subject matter seriously. 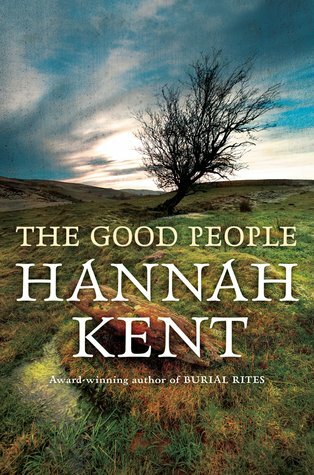 It should not be a surprise to anyone who has read Burial Rites that her new book, The Good People, is just as moving. The novel tells the story of three women who set about trying to banish a fairy changeling which they believe has been left in the place of one of the women's grandson. Nora Leahy has had a time of great misfortune, with her only daughter dying and then her husband, who was in good health, dropping dead at the sign of a crossroad. To add to her woe, her daughter's boy Micheal has come to live with her, and rather than being the happy, thriving boy that he was two years ago when she saw him last, he is now a silent, wailing, cripple of four years old. She keeps him hidden, to stop the wagging tongues of the village. But after the death of her husband, taking care of the boy becomes too much for Nora and so she goes to an employment fair to seek live-in help. There she finds Mary, a young girl who has seen a number of hard employers before and is determined to help her own family by working. She believes that she is going to help Nora with looking after a child and with the churning of butter on her farm, but when she sees Micheal, and sees how malformed he is, she is shocked. Yet, curiously, despite being kept awake by him all night, and having him wet the bed they both sleep in on the hearth, she comes to love Micheal in her own way. Nance Roche, the village handy woman, practices herbal lore and when she sees the child she says that it is not Micheal at all, but a fairy left in his place. The three women bond together to try and have the fairy child exchanged for the real Micheal through a range of superstitious means. Meanwhile, the village is being stirred up against Nance by the new priest, Father Healy, who denounces Nance as a kind of witch. I read in another review of this book that Ireland at the time this book was set, 1825, was a tapestry, and that it was hard to say where religious beliefs and superstitions melded together. Superstition is part of the culture and the setting of this book, and governs many of the lives of the characters. There are rules about everything, about whether a woman who may be barren can enter the room where another woman is giving birth, about charms to curse people, about places where you should not go, lest you be 'swept' by the fairies. Hannah Kent creates this emotional landscape very well, and it's part of the way she sets the scene. This is a book which shows how Kent is growing more confident as a writer-- her creation of the landscape is far more subtle this time, and the language is musical and strong rather than poetic. It was not until Mary came on the scene, however, that the book really took off for me, because it was through Mary's eyes that we began to see the doubt in what was going on. While Mary too believed that Micheal had been swept, she felt a duty of care for the little boy she had been hired to mind, and as the outsider, she views the rising tension in the town and particularly among the women with a great degree of trepidation. I enjoyed this book, and while I can see that it is a truly excellent book, I don't think it had the same effect on me as Burial Rites did-- but perhaps that is my own fault. Perhaps this time, I knew to expect great things from Hannah Kent's storytelling. I look forward to her next book.